Andrew Hyslop lived at home with his mother and siblings at Rennaldburn (NY 260968) or Windshiels (NY 161924) in Dryfesdale. They often sheltered Covenanters, one of whom died in their home. They buried him in secret. Word of this escaped, and Sir John Graham of Claverhouse and his men caught him in Dryfesdale. He was brought over the hills to Eskdalemuir. Sir James Johnstone of Westerhall (d. 1699) disinterred the body, destroyed the Hyslop's home and stole their possessions. Andrew Hyslop was sentenced to death at Eskdalemuir, carried out by Johnstone. He was shot on 12 May 1685 and buried at the spot. It is said to have been the last Covenanter death that Claverhouse was involved in. 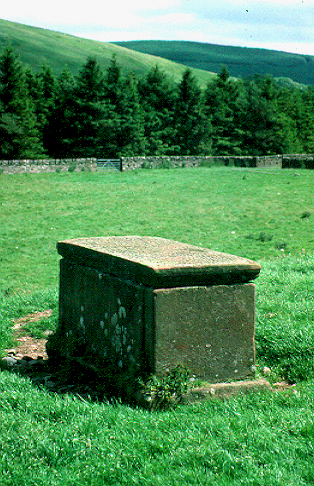 Hyslop's grave comprises of a tablestone located in the middle of a small field off the B 709, just north of Craighaugh. It was erected in 1702 and repaired in April 1825.